Hey! Welcome to Guide Tricks, the coolest texture on the web. 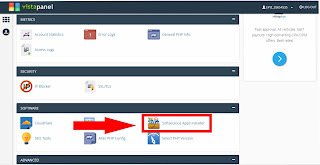 Today I am going to discuss on “How To Get Free Hosting and Install WordPress in it”. I think is topic is most common topic but the searchers do not get the correct answer what they want. 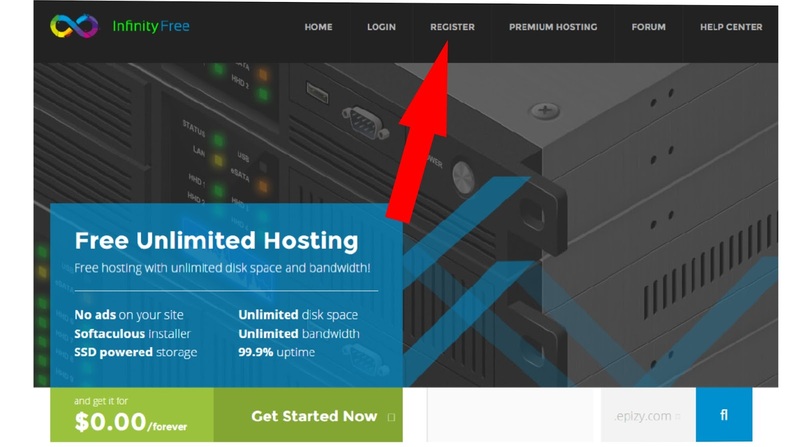 For that big reason here i am going to explain you about this topic whose name is How To Get Free Hosting and Install WordPress in it. 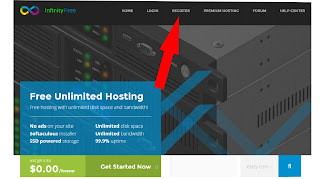 Free hosting is available in many sites on the internet but i know that you guys want to get a free hosting which includes unlimited bandwidth or traffic, unlimited subdomains, unlimited parked domains, unlimited storage or disk space, unlimited databases, no ads, all-time uptime, good speed, one-click script installer such as phpbb, bbpress, wordpress, mybb, etc. Yes, you are going to get these features in free hosting which i am going to explain today. Do you really want to know how? Then check it. 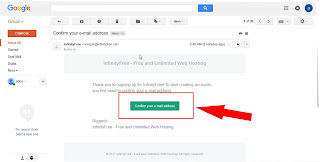 InfinityFree is a free hosting provider which provides unlimited bandwidth, unlimited subdomains, unlimited parked domains, unlimited storage or disk space, unlimited databases, no ads, all-time uptime, good speed, one-click script installer (phpbb, bbpress, WordPress, mybb, etc),SSD powered storage and much more without taking a single penny from you. In this tutorial i am also going to show you that you can install WordPress in one click in your infinityfree account. So, let’s get started. 2) Click on “Get Started Now” button or click on “Register”. 3) Now fill the “Registration Form” and click on “Register”. Note : Make sure that you confirm that you are not a robot as well as tick on the Terms of Service checkbox. 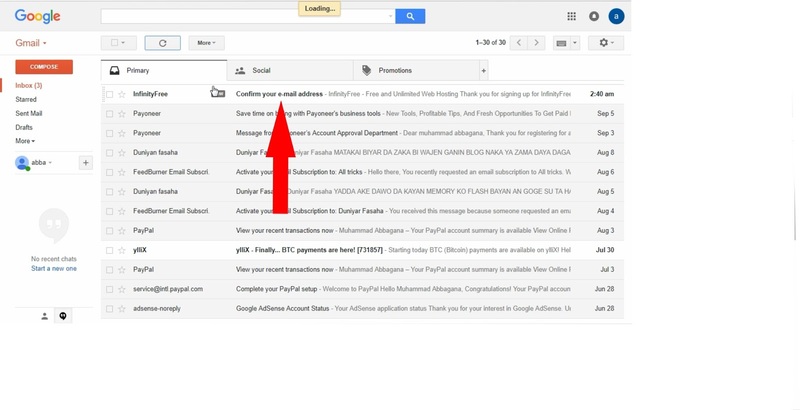 click on the confirm button or copy the confirmation link and place in your browser to make your account to be active. 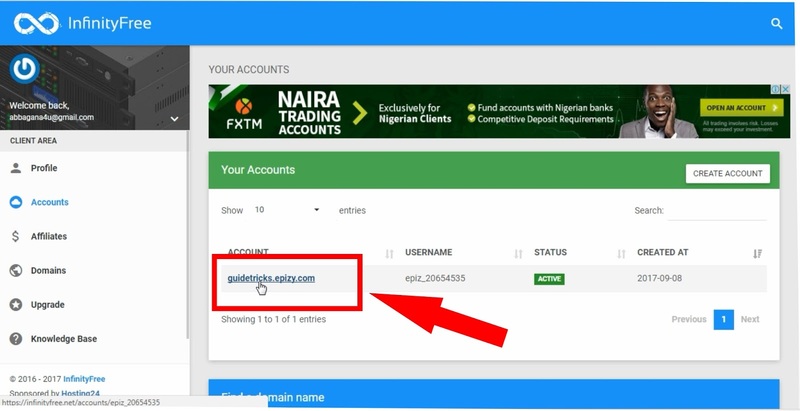 5) After verifying your account click on “Log In” button and add your login details you have provided when registering. 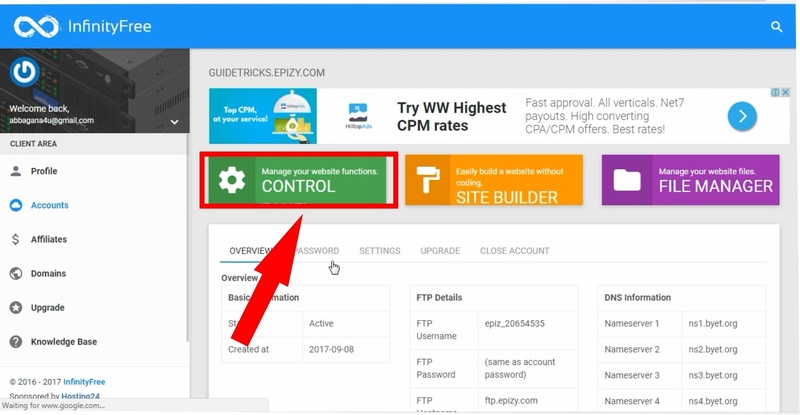 6) Now after logging in you can create your website by Clicking the “Create Account “Located and the top of your dashboard. Choose a domain name and verify you are not a robot and click on create account, wait little bit as your account is processing. After 3 minutes refresh the page and check if the Account has complete. 7) After creating a website from “Accounts Panel” click on Your domain Name button. 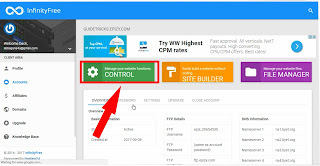 8) Click on Manage Control Panel, a new page will be opened or “VIP Login Panel” will be opened. 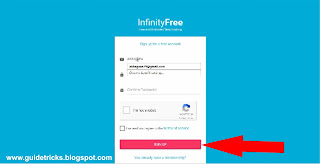 Here you have to enter your Username which you have got from the Dashboard of your Account and Password which you have used while Registering on InfinityFree. 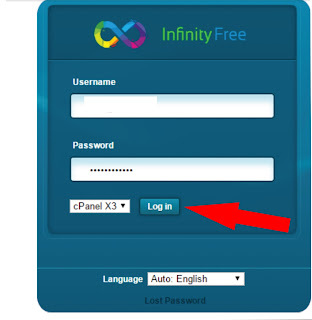 9) Now, use both details and enter it at “VIP Login Panel” and click on “Login” button. 10) Now your “Control Panel” will be open as shown in below image. You can see what features InfinityFree has given to you. Now at the down of the page, on the “Software/Services” section from your “Control Panel” click on “Softaculous”. 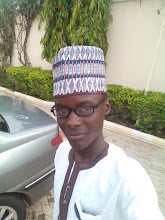 Now a new page will be opened at that page you’ll find WordPress icon, click on it. 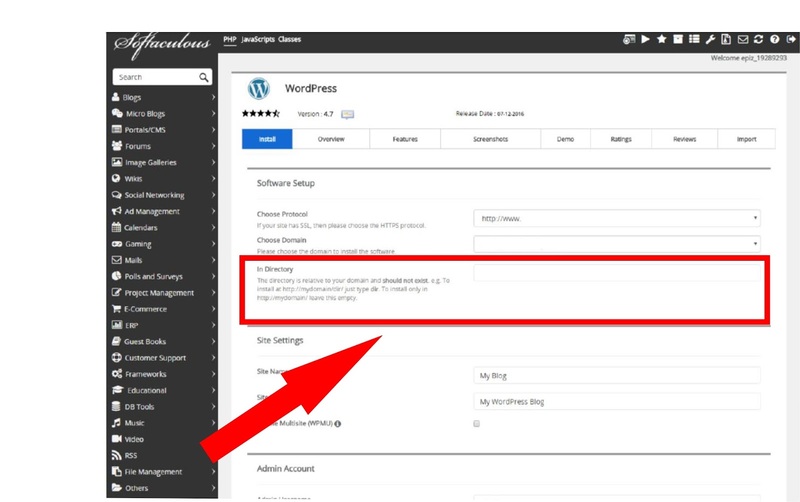 To create a WordPress site a form will be opened, here you have to fill this form. To fill this form correctly to can take help of the below shown image. 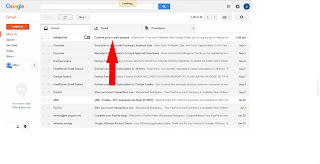 Make sure you leave the directory file empty to make it as your index means as your home page. After filling the form & applying the form, you’ll get a message like Congratulations, the software was installed successfully” and you’ll get a link of your website as well as your website’s admin panel link. Follow your website link and you’ll find your website like below image. Similarly, follow the link of your website’s admin panel and login to your website by your details which you have used at the “Step-11” while filling the WordPress form. After logging in you’ll get your “Website’s Dashboard Page” as shown in below image. That’s it. 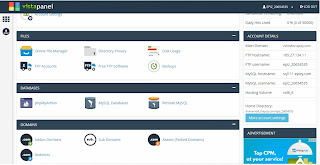 You got your free hosting account as well as you installed WordPress in it successfully. 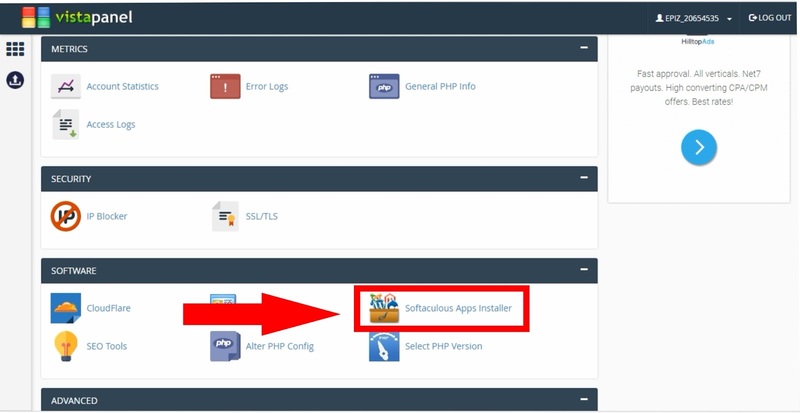 So, the above tutorial Guide us on “How To Get Free Hosting and Install WordPress in it”. I hope you’d liked it, if yes then do share this post with your friends and make sure you subscribe GuideTricks for future posts. Thank You.